Progressive stamping process is considered to be a boon, and it is for sure in most cases. However, it is not one size fits for all approach and the ones looking for progressive stamping should keep this in mind. There are a lot of benefits with progressive stamping process, but there are also some limitations that need to be considered before opting for this approach. How does the progressive stamping process work? It is not an ideal process for high accuracy deep drawing. This is evident when the actual depth from stamping surpasses the diameter from the set part. During the whole forming period, the mechanized fingers are required to keep the specific component in place during the main forming period. The process is usually carried out on move presses that run from slower speed rates. There could be ovality or concentricity problem because in the real situation of actual progressive push only the main forming cycle could be guided through the spring packed field. The progressive stamping process also needs increased uncooked material when transferring the components. When compared to common options, the tools are on the expensive side because these are made within blocks and most of the times there is no legislation per station. These were some of the limitations of progressive stamping process. 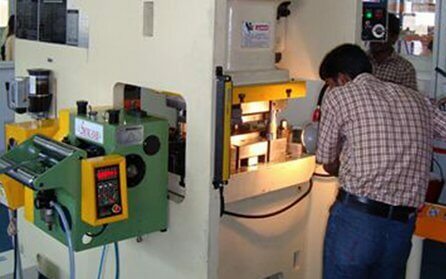 However, it is still one of the most opted for an option in precision metal stamping industry. Along with the limitations, there are also several benefits that clients look at when opting for this process. What do you decide? Is progressive stamping right for you? Progressive stamping process has its own advantage and at times limitations. So if you are having a particular project that is coming up, hold your horses before jumping to conclusions. Make sure that you analyze whether or not progressive stamping is right for your particular process. Best metal stamping kit varies from project to project. Your requirements will help identify whether or not progressive stamping process is right for you. So you need to make sure that you spend enough time in research and take professional help to identify what is the best approach for your next precision metal stamping project. Marketers sell what they benefit the most. The same can be said in this highly competitive precision metal stamping industry. Every supplier wants to advertise what is best for him. So you need to identify whether or not it is really the best choice for you before you decide to opt for a particular process. Professionals with a good reputation in the market will recommend you the right approach for your project. So you need to compare and then come up with the decision on what is affordable, quality, and suits best for the project. Rather than relying on the many promises, it is best to compare the metal stamping suppliers offerings. Look at what is best suited for your budget and then go ahead. Compare the quotes from different suppliers to get a clear idea about the pricing in the market. This will help you get top of the line progressive stamping services in the most affordable price. Eigen has years of experience in the field of precision metal stamping. The precision metal stamping suppliers also offer progressive metal stamping for selected projects. Clients are explained how the process can have some limitations in specific areas, but how a certain project could do a lot better with progressive stamping process. From inception to implementation and delivery of a product, the processes are crisp and transparent so that the clients are aware of what is happening with the project. A good customer support ensures that all the queries and questions are answered on time.